If your friends or followers would benefit from more calls, please consider sharing this article by clicking the Facebook or Twitter buttons above. Ever seen businesses that show up on Google maps and wondered how they got there? Ever wondered why people you know get calls to their businesses but your phone doesn’t seem to be as busy? 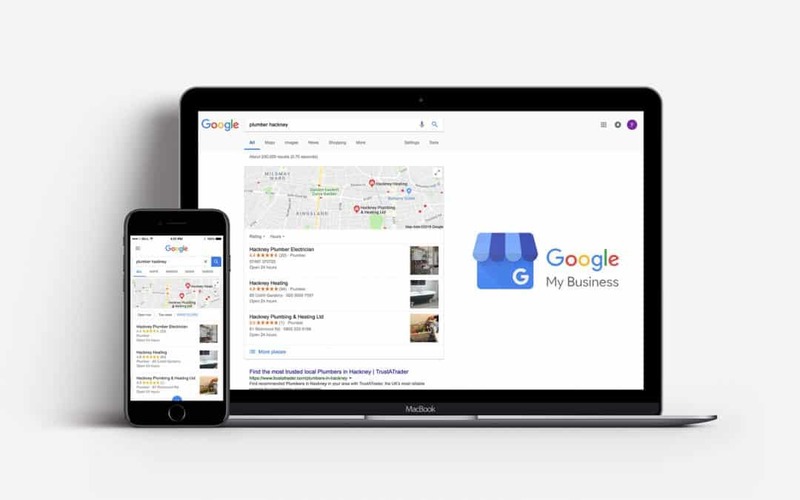 This article will show you how your small business or trade can use Google Maps (now known as Google My Business) to get more calls from their free listing. You can do this yourself by following the instructions listed in this article . When we need anything, we all go online. We jump on our laptops, phone or grab the ipad whilst sitting on the sofa at home. Customers today find your business in a completely different way from when a Yellow Pages ad would have been enough to make the phone ring with jobs. If you aren’t seen when people do a Google search – then they won’t know you exist. If you aren’t there in the results, then you can bet your competitor is. The goal is to get your business to the top of the maps by using our tried and tested method to please Google. In turn, Google shows your business as the top result in your area and then you will get the calls. Type in your service + your town (Eg: plumber in Twickenham) into Google now and see if you show up on page 1 or if you shop up in the map when you search? If not, people simply won’t find your website. The companies you see on that first page, they are getting all of the calls. These results of the Google Maps is formally known as “Google My Business” or “GMB” for short. Want your business to be there instead of them? When you do the search, do you see a map with business listings? Currently, Google lists the local maps listing above even the organic listings. Google know how important local business listings are to local searchers (your customers). This article is going to show you step by step how to give your business the best opportunity to get into that area of Google, ready? 88% of business searches on a mobile result in the individual visiting the premises or giving the business a call within 48 hours. Online searches are 300% more likely to gain traffic to your website than social media sites. Google Maps (Both the Maps app and the Google search results) are responsible for guiding 1.5 billion consumers a year to a business location. If you’ve used Google much yourself, you’ll know that to scan through the Google maps results makes it far easier to select which company you want to use. It has all of the company information laid out clearly and provides links allowing your potential client to visit your website and give you a call. It allows customers to instantly see the rating that the business has received from reviewers and also allows you, as the consumer, to leave reviews too. GMB is a great way to get on the first page of Google without having to spend lots of time and money competing with larger powerful directories such as trustatrader.com and yell.com. 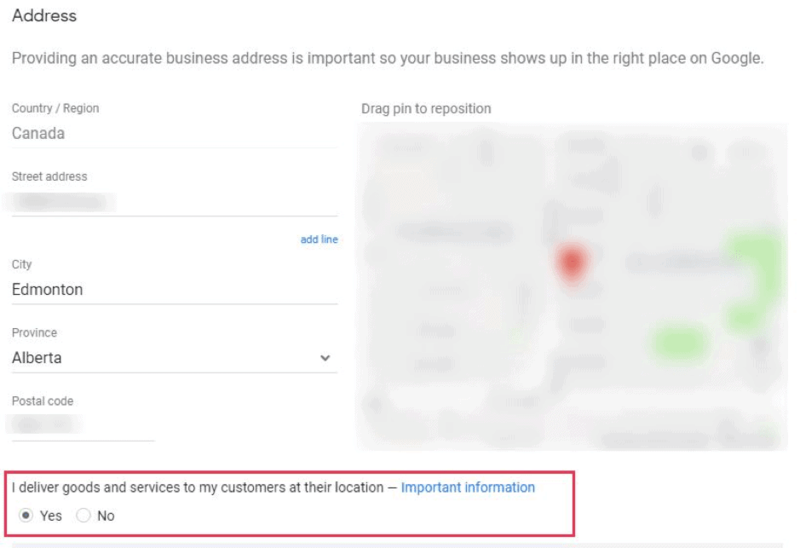 On a maps listing, you are only competing against other businesses in your area and therefore have a greater chance of showing up. 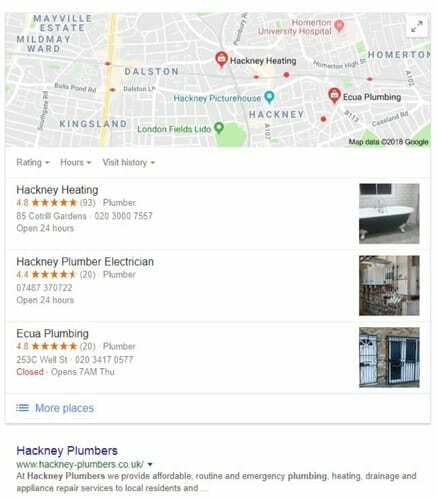 When you search Google for a service or business, such as ‘plumbers in Hackney’, the first thing you will see is the Google Maps results. These results are displayed after the paid ads and before the standard organic web page results (these are the people who have their SEO done right). A large number of people searching will click on the GMB results (the map listing). Some will click on the ads and some on the organic listings, but you can still get a proportion of the traffic to your website just from being in that map position (people will see you are local from the map). Not only does Google My Business have the ability to send masses of consumers your way, it’s also free to use. As well as allowing people to see your business at the top of google you can also add a tonne of information that’s useful to your customers. You need to ask yourself, if you were a customer looking for your services – what questions would they have? What do you need to answer for them to call you? 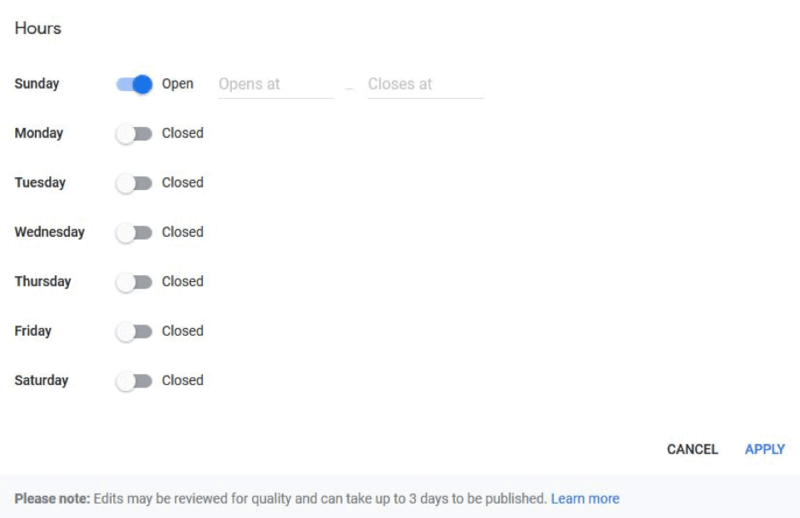 GMB let’s you add your opening hours, your website address (a great backlink to have that can help your organic SEO), phone number, physical address. You can also add photos, videos and virtual tours of your business premises. You can keep your customers updated with your latest activities or offers by using the ‘posts’ feature and customers can even leave reviews of your business to see what level of service they can expect from you. You can reply to these reviews if you verify your listing. Verifying the business listing allows you to add and edit the information about your business which gets shown to people who search for your business in your local area. This means you can optimise your listing and increase the likelihood of ranking your business higher in the Google Maps results. You can edit all of the information and optimise your listing as much as you like, but unless you verify your listing people will only be able to view the basics. Verifying also means that you can reply to the reviews that people leave on Google, answer questions that people ask about your business, and create posts that communicate your latest news or offers with the audience that Google provides. If You’ve Realised It’s a No Brainer – Let’s Get Going! You may find your business is already a maps listing (as an unclaimed business). Google collates data from Companies House to add some of its listings, it’s then up to you to find, verify and optimise your listing. If you are not a limited company, Google may not know your business exists so will need to manually add the listing yourself. To find out if your business is already listed you just need to search for your business name in google and see if your business comes up in your area. If it does come up and no one has verified the listing you will see the ‘Own this Business?’ as shown below. It will then take you through the same steps that we’ll go through below. 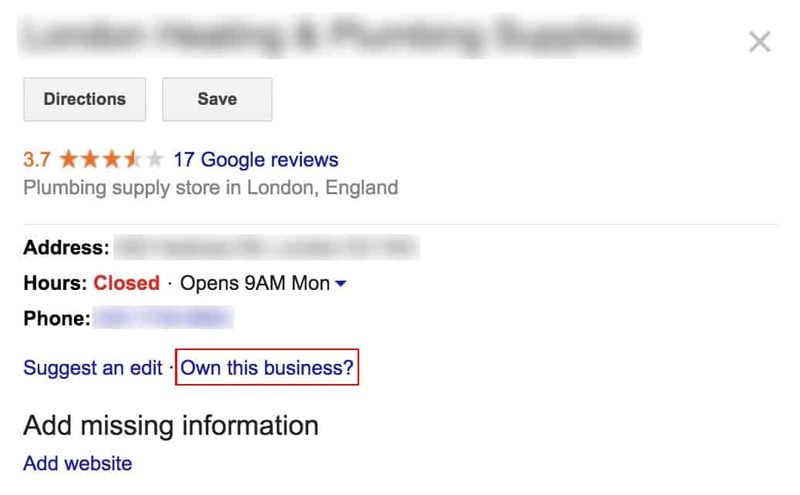 If someone has somehow verified your business listing (this is only really likely if you have bought a business from someone rather than set up your own) then you need to head here to google support and request ownership. 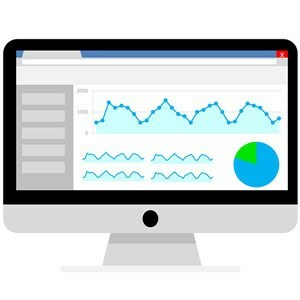 If your business isn’t listed at all you can just head over to https://google.com/business. From there you can set up your business listing. This is what a lot of business owners do, but then fail to optimise their listing. Remember that the ultimate goal is to be in the top 3 listings when people search for your keyword + area (eg plumber, hackney). You will only have a chance if you optimise the listing. What if you fit in more than one category? If your business fits in more than one category then you just need to add the one primary category that describes your whole business. If you’re struggling to find this then we would suggest opting for the main service you offer, or if you really are 50/50 then consider creating multiple listings for different aspects of your business. For example, if you own a retail store that sells supplies for plumbing work, but you also offered plumbing services then you can set up a business listing for each aspect of your business (one for plumbing services and the other for retail store). 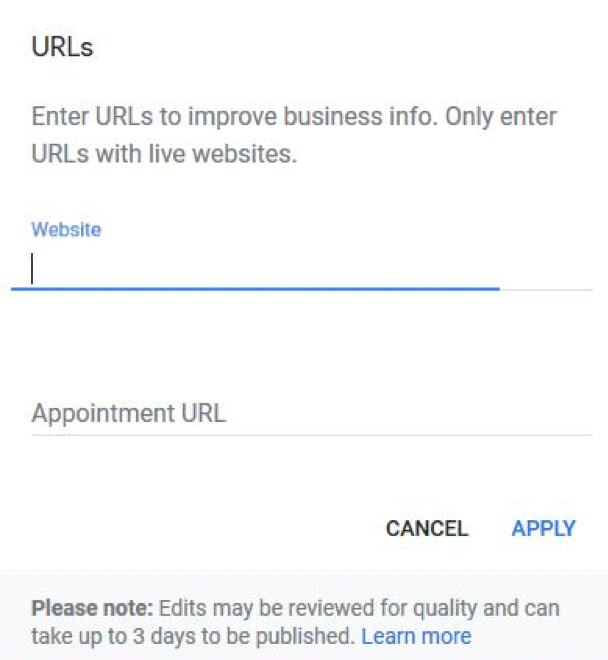 Once you’re at https://google.com/business you need to either sign in or create an account. Creating an account is a simple process of entering your name, date of birth, email address (or creating a Gmail email address), gender and setting a password followed by agreeing to Googles terms and conditions. You’re then taken through a process of entering your business details, starting with your business name. After you’ve told Google your business name you’ll be asked to add your business address, select your business category, add your phone number, website, and finally asked whether you would like to receive personalised information from Google about how to improve your listing (a bit of Googles advice about how to improve your Google listing never hurt anyone!) You can then click to finish and start to optimise your profile. NOTE: It’s vital that your business name, phone number and business address is noted down. We will need this elsewhere later on. All you need to do here is enter your name and Google will send a postcard to your business address that contains a code that you will be able to use to verify the business address. You need to do this so that your extra info can be viewed by the public. You can continue optimising your listing now, but your changes won’t show on Google until your business has been verified. The postcard will usually take around 4 days to arrive. Now you can start adding your business details to your listing. What you’ll now be faced with is your Dashboard. It looks more complicated than it is. The main screen on the left is you dashboard. At a glance it tells you how much of your listing you’ve already optimised and asks for more of the basic info that it needs. Below that it allows you the option of creating a virtual tour of your business (which can be useful if you run a physical business such as a dental practice ). Below that it gives you the option of having your own personalised business email address through Gmail. There are also options to create posts and share news and information with customers. Ideally you will use this regularly to share information, as well as doing all of the initial optimisation of your listing, it really helps to stay active and this can be updated on your mobile with their GMB app. The main thing we’re interested in right now though is the column on the left of the screen. The third option down is info, and it’s here that we can edit all of the basic information about our business. Some of this information should already be filled in as we entered it when we created our page. It only takes a few minutes to fill this in, so think about what sets you apart and why a customer should choose your business. If you’re a store of some kind then you’ll know your opening hours, but if you’re a tradesperson you might want to set your opening hours a little more than the standard 9 to 5… especially if you’re actively seeking new clients. Set your hours to a time you’re genuinely prepared to take calls from people because later on this will need to be used elsewhere on various other websites called citations and it needs to be consistent (the same on every website directory). This needs to be your physical location where people are able to find you. As a tradesperson this will most likely be your house, and it’s unlikely that people will come knocking at your door (and it’s even more unlikely that you’d want them too) but customers will usually opt to phone/text or email instead. If you don’t want your home address to be made public, you can check the box that says you deliver goods or services to your client’s house. Here you just need to enter your existing web address. Google will link to this website from the listing and it will be the first place people will go to find out more about your business. A lot of business owners feel that a Facebook page is sufficient, but a website is vital for any business that wants to be taken more seriously and also have more control over their online presence. Having a good website that’s properly coded can also massively help with your SEO and organic listings – meaning even more traffic to your website and calls. Remember – even if people go to your website from the GMB listing, it’s unlikely they will call if the website doesn’t look professional. This is a link for people to book appointments with you. Use this if your business is largely appointment based. You can link to a contact page, a calendar or any appointment booking software your business might have to easily enable potential customers to book an appointment with you. Even if you’re a plumber and you’d think it was fairly obvious that you offer plumbing services it won’t hurt to give people examples of these. Enter some of the common jobs you do such as cleaning drains, replacing sinks, replacing toilets etc, or any jobs that you can guarantee a set price on. For example, if you’re a female tradesperson you might want to put this here as it’s something that a person might specifically want, or you could put ‘no-obligation quotes’ – anything that you provide that might attract someone to your business above others. You have 750 words to share with the public a description of your business. That’s 750 words to describe your mission, the history of your business, and what services and products that you offer. That’s a lot to get into such a small space! There are a few obvious rules to what you can put in this box, including nothing that is misleading, offensive or relating to the sale of dangerous or illegal items. However, there are a few not so obvious rules, such as no links, no advertising offers or promotions, and it must not display low quality, irrelevant or gimmicky content (it’s Googles decision as to what exactly qualifies as any of this). The business description is a great place to really make your business listing stand out. It might also help you to know that only 250 of those words show before the reader has to ‘read more’, so you want to put your most important keywords – including your town or city – in those first 250 words. As a tradesperson, you might not feel as though photos are important because you don’t have a location to take photos of, but it helps to optimise your Google listing closer to being 100% complete and it also helps people viewing your profile to trust you. Take some nice photos of your van, you at work, add photos of work you’ve done – give people a chance to get to know you better and know you’re a legit business. You need to choose a cover photo and a profile picture, exactly the same as you would with any social media, but you also have a number of other options. You can upload videos. This could be a tour of your premises (if you have them) or just you introducing yourself if you’re confident being in front of the camera. You have the option of uploading pictures of your team, pictures of you and your team at work, and also images of the exterior and interior of your business. To further optimise your listing using photos and videos you need to make sure that your images have names that are relevant to what people might be searching for in order to find you. Here is you take your photo and video optimisation to the next level. When you take a photograph, your camera or phone will automatically give it a file name that is usually a random assortment on letters or number (such as 93254.jpg). When you add this photo your listing you should change that name to something relevant such as ‘plumber in hackney’… If, of course, you are a plumber in Hackney. You can also use geotagging. With whatever app you’re using to take photos with go to settings and ensure that the location tags is switched on. This will attach, embed and store geographical location data with each picture and video. Google will read this data and see that your listing is locally relevant. Now that you have verified and optimised your GMB listing, you need to get something called Citations. Citations are the most important aspect of ranking your GMB listing and getting calls from customers. A Citation is a specific mention of your company on a relevant website. Remember earlier on in this article we said to copy down the EXACT way you named your business name, address and telephone number? This is known as your NAP (Name, Address, Phone) details. Your NAP is what Google uses to associate your business to your listing. When you are listed on various directories and websites, if you list it in the correct way then that adds an additional score to your listing. The more places you are listed and the better the website or directory you are listed on, the high the chance you will rank for your local area. Cool huh? It means you have greater control to take the bull by the horns and get ranked on GMB. If you want help getting onto 50 of the best UK directories to boost your GMB listing, Holmes Design offer a citation service which you can order from us. 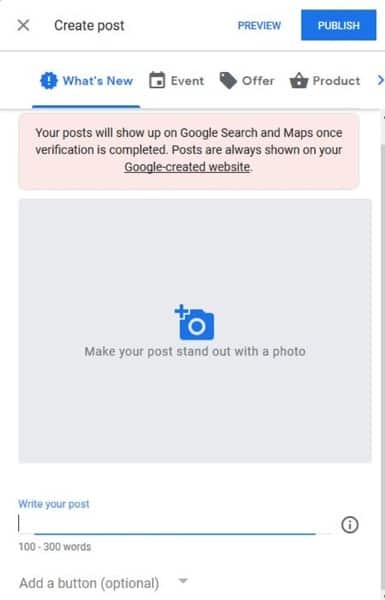 We touched on posts earlier, these are a great way of marketing to your google audience and showing off any special events or promotions you have going on. Google places a great importance on having users continuously engaging with them, and using the posts feature is a great way to do this. It also shows you’re actively keeping on top of your listing which for customers, shows you’re relevant and active. You can add a general post sharing anything related to your business, or you can add a post to promote an event, a specific product or a special offer. If you want to add a call to action button to your post you can do that as well with the optional ‘Add a button’ dropdown. It creates a better experience for consumers and makes Google the go to place to search for local businesses. While the posts themselves don’t actually help you rank any higher on the Google Maps listings they optimise the conversion rates of the visitors that see your listing. Engage with your customers. 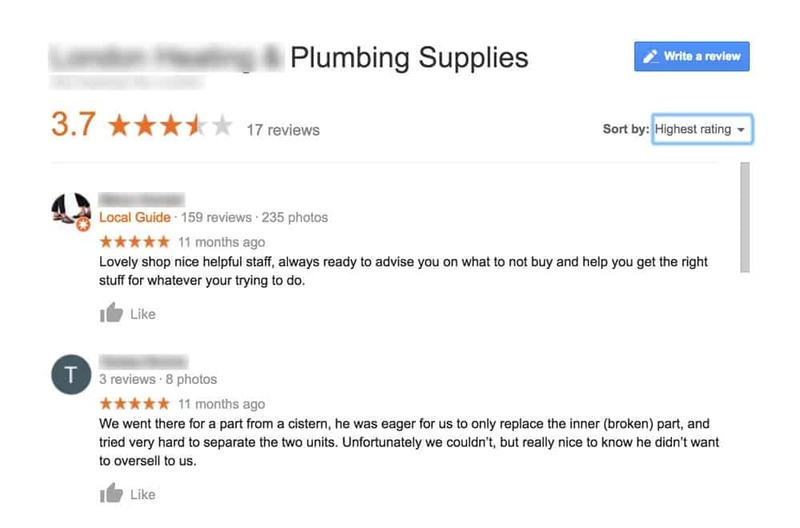 Google allows users to leave ratings for your business and when you have a verified account you can respond to these reviews. That’s a great opportunity. Thanking people for their positive reviews only reinforces what a great business you are for those who are reading them and responding politely and apologetically to the negative reviews (no matter how wrong they are) also makes you look like a great business. It also increases opportunity for referrals and word of mouth business. Quick Tip: Ask your customers to leave you a review on Google. The more reviews you have, the more the search algorithms are likely to list your business higher in the maps (it’s a ranking factor). You can download the GMB app from the app store and do this from your phone, in between tiling, plumbing, carpet cleaning or whatever you’re up to! If you have a trades buddy looking for work and wanting to rank on Google – show them this article. We hope you found this useful. If of course you’d like us to optimise your listing for you, we charge a flat fee of £495 to do it for you – just contact us. 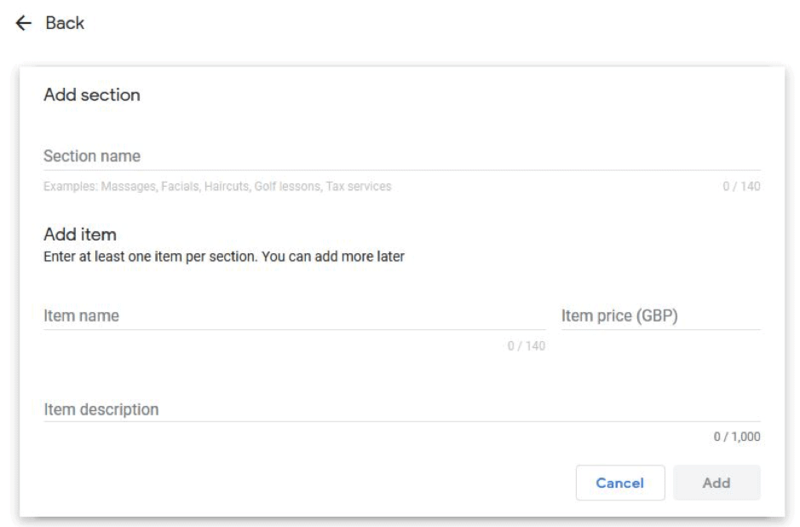 Step by step, how to article on optimising your Google My Business listing, formally known as Google maps, so you can get more customers and calls.